Boy what perfect timing as I just got in new toys! 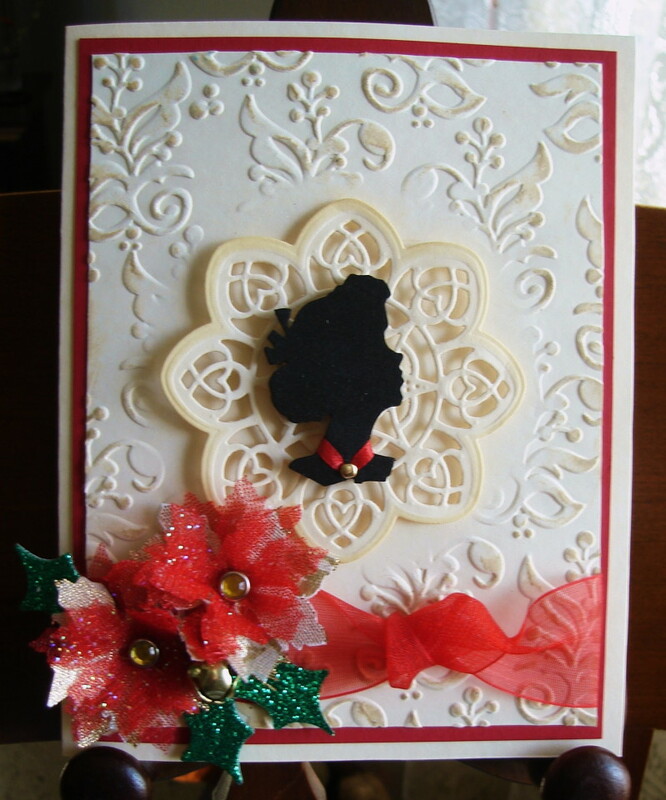 Linda is asking us to work with Chipboard and Metal for this challenge. Using my Embossing Diffuser plates (#657945) and Sizzix folders for the background, which was stained with distress ink. For the Poinsettias I cut red Christmas ribbon and layered it with white and gold Christmas ribbon. 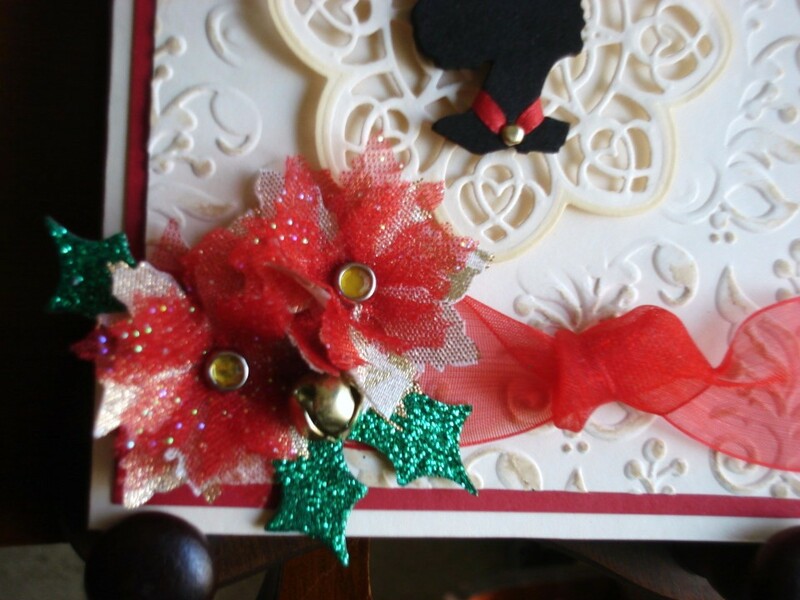 Added gold brads for centers and a gold jingle bell. 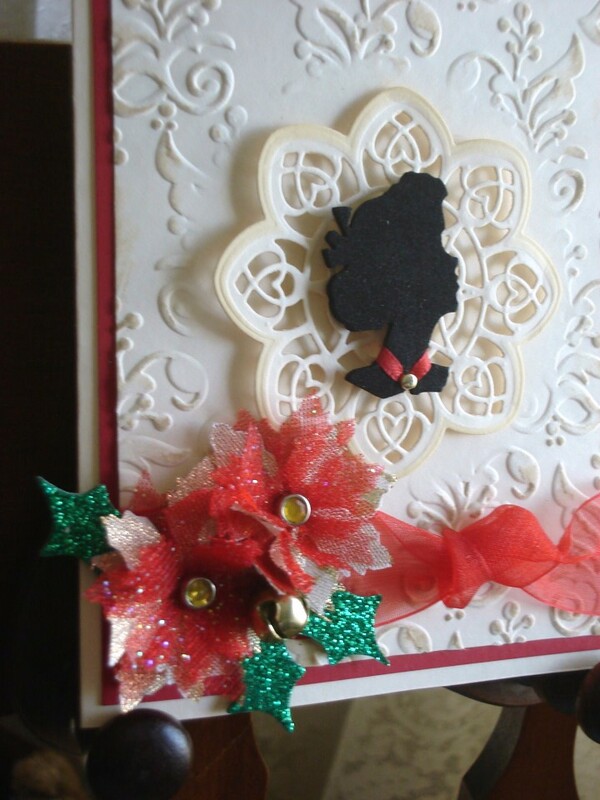 For my chipboard I used green glitter holy leaves. 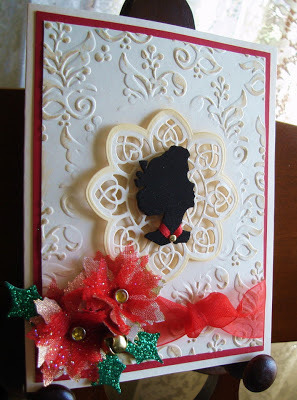 Frilly and Funkie Blog to see all the wonderful work the ladies have posted. Oh I love it when you get new toys, because it is such joy to our eyes! Vada, I love how you used the silhouette and place her right in the middle of the "diffused" pretty embossing! Those poinsettias are gorgeous and so delicate! Thank you so much for playing along with us at Frilly and Funkie! Hugs! PS: I just used some of the leaves you gave me. So pretty! Thank you again! wow, this is elegant and beautiful...hope you have a great weekend! She's lovely and so striking against that background. As always Vada, just stunning work! Oh, Vada, this is so beautiful... I just love the texture and the way you've applied color to only parts of the raised areas. Totally lovely. Thanks for joining us at Frilly & Funkie! I love the silhouette! Don't have those yet but I just might NEED them now that I've seen what you did with it. The diffused background is just gorgeous! You have the perfect touch with the distress ink there!